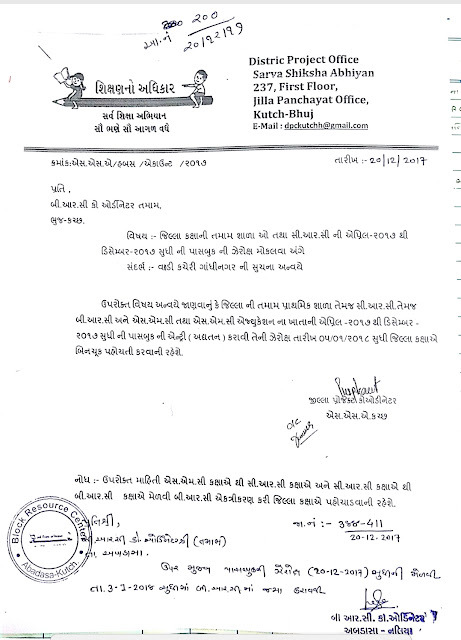 Kutch-Bhuj :- CRC Ma SMC NI PASSBOOK NI DECEMBER SUDHI NI ENTRY STAHE Xerox Jama Karavva Babat Latest Paripatra. By visiting Tips Alert blog you can stay connected with govt. job updates, sarkari naukari and other private jobs in Gujarat. You can also get current affairs, study material for competitive exams in Gujarati and General knowledge (GK in Gujarati).